Continuing with my vacation theme, another place that we saw in Little Rock was the Heifer International Headquarters. (Heifer is one of my favorite charities — giving animals and training to people in need with the proviso that they in turn “pass the gift” and give the animal’s offspring to another family in need.) When they went to build, they were first told no by the Environmental Protection Agency. The land that they wanted along the Arkansas River was “too toxic” to use. Instead of giving up, they removed 75,000 tons of earth and cleaned up the site. Now, instead of an abandoned railroad yard, the Heifer building is a gorgeous, LEED Platinum facility, surrounded by land that has been transformed into a wetlands area. The results inspired the Clintons to continue the trend, so next door to the Heifer Headquarters sits the new William J. Clinton Presidential Library, another LEED Platinum facility surrounded by controlled wetlands and trails. They even reclaimed an abandoned railroad bridge over the river and connected it to 15 miles of walking/biking trails along the shores. When we went on tour, the guide had us look out over the Little Rock skyline — and the $2 billion in new construction that has occurred since Heifer first reclaimed its land. It certainly would have been easier for Heifer to find another location for its headquarters — either in Little Rock or in another city, but it would have been inconsistent with its mission. “If we’re going to have a lasting impact on ending world hunger, then everything we do must renew the earth and not deplete it,” said Jo Luck, Heifer’s president and CEO, on the Heifer website. Heifer’s decision to build this kind of building is totally congruent with its mission. Clinton’s choice to contribute to the revitalization of the downtown Little Rock economy is also in alignment with his lifelong work on behalf of the state. I believe that both made their building decisions to be authentic with themselves, but wound up having a large external impact as well. How can you translate your mission into visible, tangible manifestations such as the type of building you occupy or the location where you build it? Are there other significant ways to practice what you preach? Even if it isn’t the easiest way to do something, it might be the most important. Choosing the hard road can be the high road for both your organization and its community. 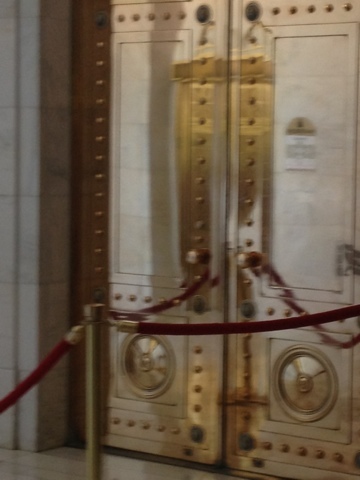 Couldn’t the state replace four of the six doors and leave just the middle ones with bronze? Or leave the interior side to tarnish for a week since rarely anyone sees them? Perhaps they could reconfigure the security set-up and actually use them if they are to remain? 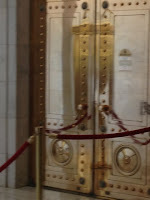 Does your organization have the equivalent of bronze doors — something that is a resource drain, but is kept on just for show? Is it really necessary or are there better uses of your time and assets? Look around and see if there aren’t vestiges of something that made sense at one time, but has outlived its usefulness. What once was symbolic with one meaning may serve as even stronger symbol for change if you take steps to replace it. I just got back in town from a vacation my sister and I took to Little Rock, Arkansas. I fully understand that this is not a destination choice for most people, but my sister is on a quest to see all 50 capitols (this was #43) and most Memorial Day weekends I join her. The inside of the capitol had the requisite stained glass and marble — but what was more impressive was one person in particular that we met — State Representative Richard Womack from District 18. He saw us when we were trying to peek between the locked doors to get a glimpse of the House chambers. Instead, he brought us around through the private entrance and took us onto the floor from the inside (even though non-representatives are not allowed there and we’re not supposed to tell!) It is Mr. Womack’s first term as representative; he is a carpenter by trade and fosters several children, but decided that he did not agree with the candidate who was running and so he “had” to run himself. He chatted with us about how much he has learned in his first term, and how he will certainly run again because he thinks he can make a bigger difference now that he has the process figured out. Mr. Womack and I may agree on little about the political platforms, but my sister and I were both impressed by his commitment. He publicly exhibited courage by expressing his beliefs and standing up for what he thought was right. Instead of complaining about the process, or grumbling about the person who was running, he took action and raised his hand himself. He is a family man and entrepreneur who is making sacrifices of his time and talent to do what he believes is helping the public good. It was a live version of Mr. Womack Goes to Little Rock, with the hope and innocence that it entails. He was inspiring! Mr. Womack did what appeared to come naturally to him — extend a generous dose of Southern Hospitality and give two perfect strangers a few minutes of his time. The personal stories that he shared and the conversation we had with him was one of the highlights of our trip. 1. If you believe in something, raise your hand and volunteer to take action on its behalf — don’t watch from the sidelines. Have the courage to take a bold step. 2. A small gesture of kindness can go a long way in making a lasting impression on the beneficiary of your gift. Little actions are significant too. If you were no longer around and someone had to clean out your house and office, what would they be astonished by? I have been involved in several moves/purgings lately, and it causes me to look around at all of the things I have personally accumulated. To me, everything is organized and of value, but if I were a neutral party and had to empty my home and office, I imagine that the desirability of all contained within would drop significantly. There are certainly people who visibly have too much “stuff” in their possession, but I believe that each of us is a secret hoarder of some type. We find something that we love, and then collect another, and another. I am reminded of Anne Morrow Lindbergh’s 1955 classic Gift from the Sea. When she first arrives for a retreat at the beach, she instinctively collects pockets full of shells. After some time in reflection, she realizes that she needs to discard some shells in order to appreciate the few. “For it is only framed in space that beauty blooms,” she wrote. As summer approaches, intentionally make the effort to create some space in your life. Free yourself of some possessions. Clear away some time on the calendar. Do some discarding so you can appreciate and be more intentional about what remains. Memorial Day is considered the official start of summer. It used also mean that you could now wear white shoes until Labor Day. Any sooner than that was considered a taboo. Are there any similar fashion rules that remain in effect? I think now anyone can wear any color on any day. And as I have written, why limit yourself to the same color for all 10 nails, or your hair, or your socks or anything else. The fashion palette has exploded. But Memorial Day is more than picnics and white shoes. As you go out to celebrate on this Memorial Day, dig through that closet of yours and find some red, white and blue to wear. Take a moment to remember those who died in battle so that we could enjoy our many real freedoms, not just in accessorizing, but in those that truly matter like free speech, the right to assemble and to bear arms. Most days you dress to express your individualism. Dress today to commemorate your community as part of this great nation. Every Sunday night in the summer, I hear the continuous “whir” of stock car racing in the background. I live several miles from the speedway, but there is an unmistakable noise each week for several hours. This leaves all the differentiation to a strict set of allowable changes, but mostly the success is up to the driver. Much of the same is true in organizations. Often, you are providing the same physical product as a competitor and norms require you to remain within standard parameters. What differentiates you is how you deliver your service and how your people “drive” the organization. Invest as much as you can in your drivers. Even on the county speedway, the checkered flag only waves for one. I love the lilacs that are in full bloom these days. I don’t have a bush myself, but I cajole a friend who does enough that he keeps me in good supply during the short blossom season. I think lilacs are a metaphor for power. There really are enough lilacs/enough power to go around. Just because you give some away, doesn’t mean that you still don’t have plenty left. You can be very, very generous with your lilacs and still have a robust bush. What you do give away comes back, often more fully than what you cut. Lilacs are abundant and free. They can be enjoyed by the source of the flower and those who receive the blossoms as a gift. The scent of the flower permeates beyond the immediate petals — everyone in their presence is impacted. It is sad to see people who operate with a scarcity mentality. Think of your power like a lilac bush. There is enough to share.